King really hit it out of the park with this one. Like Michael Connelly, King has the knack of keeping a series alive with a book that is as good or better than the last one every time. This one picks up where The Lanugage of Bees leaves off, like the next minute. I found it interesting that King never picks back up the whole abandonded bee hive issue that consumed much of the first hundred pages of The Language of Bees. Which was fine with me. It was starting to pale for me before the real spine of the story kicked in. In The God of the Hive, King takes the multiple POV even further, as the story requires it, but the majority of the story remains from Russells POV. There was one small thing that annoyed me, a little dirty trick of misdirection done by pairing two scenes but (unknown to the reader) putting them out of chronological sequence. It created a lot of suspense for several dozen pages, but when the reveal happened, it felt like one of those scenes where you're all drawn in and then discover it was only a dream. But a minor quibble on what is an excellent book. Waiting for my copy of Pirate King to arrive. In The Language of Bees, King accomplished a difficult task - to write a cliff hanger with a satisfying ending. I didn't realize this story was continued in The God of the Hive, and when I got to the end, that didn't bother me at all. The ending felt like an ending. The important points were wrapped up and the loose threads felt like they would take care of themselves. In this novel, King continues the use of mutiple viewpoints she started in the last novel, but instead of the large sections in the POV of either Russell or Holmes (omniscient) as in Locked Rooms, The Language of Bees is primarily in Russell's POV with the occasional scene of Holmes and Damien rendered largely as dialog with little POV orientation. But that's all the technical stuff. As a reading experience this started out a bit slow, taking close to a hundred pages before Russell really gets engaged in the investigation. However, it makes up for lost time and pretty quickly turns into a nail biter. This is vintage King/Russell and should not be missed. More Mary Russell goodness from Laurie R King, this time set in San Francisco. This time around Mary herself is in trouble and the mystery to solve concerns something that happened when she was six, during the aftermath of the great earthquake of 1906. Something she knows nothing about, but which has placed her life in danger. In keeping with King's penchant for weaving in real or fictional characters of renown, a well-known American detective teams up with Holmes to play a significant role in the investigation. Prohibition also plays a big part, along with flappers and other icons of the Roaring Twenties. On a technical note, all previous Mary Russell novels are exclusively in first-person POV. Locked Rooms has sections in Mary's first-person POV interspersed with sections in third person omniscient (sort of) which chronicle Holmes' side of the investigation. This technique is continued in the next Mary Russel novel, The Lanugage of Bees. It also features something that King tends toward, a large section (30 pages) that explains all the backstory and pulls the strands together. Of course, Doyle himself used this technique a lot, so it's appropriate for the genre. Such sections can get tedious, but didn't in this instance. Another Mary Russell novel worth reading. Get on it. I bought this Kindle book and House of Skin three months ago in response to the storm of controversy that Davenport fell prey to in the clash of the old guard (traditional publishers) and the new guard (ebook self-publishing). I won't go into the various sides of the fracas, but there are probably points of merit in both camps, although I tend to side with the author, for obvious reasons. I haven't read her previous, traditionally-published, work, but the endorsers include Alice Walker (The Color Purple), Isabel Allende (15+ novels, 30+ awards), Norman Mailer (need I say more? ), The Washington Post and The Chicago Tribune. Despite the very amateurish cover that screamed SELF PUBLISHED!!! I grew hopeful. 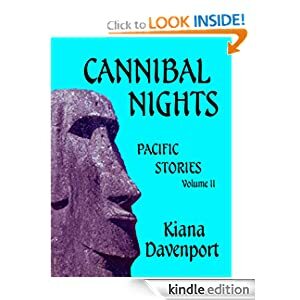 As the title suggests, Cannibal Nights is a collection of short stories. I'm more of a fan of the long form, although I have thoroughly enjoyed many short story collections, including those of Damon Runyon, P.G. Wodehouse, G.K Chesterton, O'Henry, Flannery O'Connor, and others. Aside from the last, not necessearily literary, perhaps. While I found Davenport's writing engaging in spots and well crafted in others, I was disappointed. In many cases I felt like I was getting a story in summary, rapidly glossing through the high points with the occasional dip into an immediate scene, which failed to pull me into the narrative and connect with the characters. There were moments in George Bush and Papa at the Paradise that I enjoyed, and some of the title story, but often I felt the plot of the stories to be ennervatingly inevitable, cloyingly melodramatic, or tritely tragic. Given the endorsements, I suspect that her other work is more compelling. We shall see what House of Skin brings us. Unfortunately, the formatting of the ebook was as amateurish as the cover. Absolutely zero navigation from the Kindle menu, although there is a TOC near the front. To get to it, you have to navigate to the cover and page forward ten pages or navigagte to the beginning and page back four pages. No logical TOC, no left/right button navigation between stories, which means she didn't create a toc.ncx file. Vertical spacing is formatted via blank linespaces, so when you scroll between TOC items, you have to scroll through the blank lines as well. Chapter headings are formatted with the anchor inside the heading tag, which means that the heading loses its formatting when navigated to via the TOC rather than the next-page key. Paragraph formatting and scene changes are formatted properly. I wish Davenport well, but if she's going to self-publish, should step up to the plate and either learn the technology or contract it out to a competent freelancer. And get a real graphic designer to do the cover. Disclaimer: JLR is not for everyone. We've reached the end of the year and the end of the extant Hap and Leonard books. As per classic Lansdale, the stakes are upped. I don't want to give away the ending. I'll just say that Hap ends up so far out of his league and doomed for failure that I don't know how any H&L tale after this can be anything except anticlimactic. Here are a few gems I noted while reading Devil Red on the elliptical. She was starting to get pretty lit, though she was an experienced drunk and wasn't losing her focus on the story, and the words came out clear, if slightly spaced, as if they had to stop and rest before going on. He was all over the road, like a sidewinder snake trying to drive a tricycle. Kincaid was sitting behind a large desk, and he looked older than sixty by no more than a hundred years. He was white-headed and his face seemed to have collapsed at some point and been blown back into shape with a water hose. Devil Red has the usual cast of smartass good guys and bad guys and plenty of violence and gore. In other words, it fits in well alongside the others. Check it out if you're so inclined. I found The Game so intriguing that I grabbed a 99-cent copy of Kim for the Kindle and read it through. This copy has photos of woodcut illustrations by Rudyard Kipling's faother, J. Lockwood Kipling. A great story. It's a shame I never read any Kipling up to now. 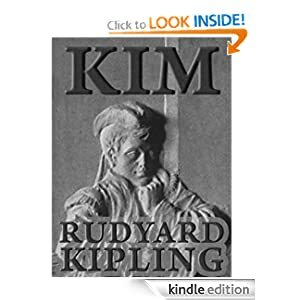 As a classic, I've always been leery of Kim and other Kipling novels. You know how classics, like other things that are supposed to be good for you, can be. Tedious, unpleasant, boring. As Robertson Davies said of a character in A Mixture Frailties, "During the first day or two she attempted to get on with War and Peace, but found it depressing, and as time wore on she suffered from that sense of unworthiness which attacks sensitive people who have been rebuffed by a classic." The writing style in Kim is dated, but engaging. It's a story of a boy and a Buddhist priest on a pilgrimage mixed with a spy novel. If that doesn't sound interesting, think again. Recommended reading. Fully functional navigation, including TOC and chapter forward/backward keys. In an earlier review, I said that King did Doyle one or two better. After reading The Game, I think she takes Dorothy Sayers game to the next level as well. In this story, character and sense of place trumps plot, which is quite Sayeresque (if I can use that word), but Mary Russell feels more vivid to me than Lord Peter Wimsey. Of course, it's been a decade or more since I've read Sayers, so perhaps I'm speaking a bit out of turn, but I don't think so. Like Kipling's Kim, on which this story is based, and like O Jerusalem, large portions of the narrative are devoted to travelling, which could get tedious in less skilled hands. I found some of the tricks of Holmes' travelling magician to seriously stretch credulity, but if that is a flaw, it is a minor one. However, the account of the first pig hunt had me turning pages like a madman, completely riveted and oblivious to my surroundings. It far surpassed the hunt in Justice Hall, although for some reason it reminded me of the horse-riding scene in A Letter of Mary. I don't know what more I can say that I haven't said before to motivate you to read this series. Just do it. For a guy who doesn't read thrillers, I seem to be doing an awful lot of it lately. This debut offering from CBS News anchor/correspondent/commetator Harley Carnes is the novel equivalent of watching an entire season of 24. Carnes starts off the novel with a literal bang, a schoolyard bombing in France, and ratchets things up from there. In addition to the gradually unfolding plot of terrorists smuggling nukes into the US (Hmm, why does that sound familiar to me?) there are increasingly intense set pieces that build to the thunderous climax. The first of these scenes involves a showdown on the George Washington Bridge that rivals anything I've seen or read in the genre. As Southern boy who has been a resident of NYC for the past 30 years, Carnes knows whereof he speaks when it comes to the Big Apple, which is where the novel is set for the most part. You really get a sense of a wide swath of the life of the city, from the halls of power to the seamy underbelly of the streets. He's also an aviator with over 25 years of flight time, which comes into play in the story's dramatic and tension-packed climax. In that regard it reminded me of another book I recently read in which aviation played a big part, Pilot Error. One thing I liked about the book is that Carnes isn't shy about dialing things up a notch or two. In several scenes I found myself thinking, "He's not going to do that, is he? Oh, yes, he is." If you're the type to read political action thrillers, you should check out A Hole in the Apple. I found several typos in the book, like "blueToyota" and "New York city." I'd be surprised if the typos are in the print book, although it is possible. Some publishers are less diligent in proofing the final draft of ebooks than for pbooks. Full working table of contents, chapter navigation buttons. Proper paragraph formatting and scene breaks. I'm coming down the home stretch on the Hap and Leonard stories. Only one left after this and it just came out, so I don't have it, yet. 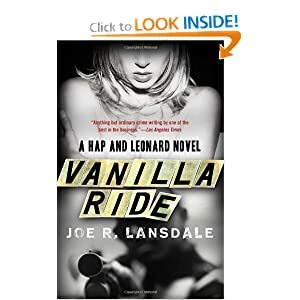 Vanilla Ride is more of the classic Lansdale H&L thrill ride, and is back to something more like a real structure than the last one. At least there's a definable goal, although it changes from rescuing Marvin's daughter to retrieving a mobster's son. And it sort of goes off the rails after that. 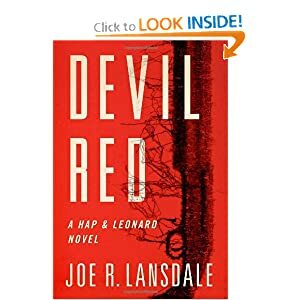 Most of what happens in a Hap and Leonard story isn't exactly plausible, but it's usually entertaining, especially if you like stories of people pounding and shooting each other interspersed with witty, if juvenile, banter. And evidently I do, although I didn't realize it before. P. 6. She had on a white shorty robe and her hair was bed fluffed and her legs were long enough to make a giraffe drown himself. P. 9. Used to, you could leave your wallet on the porch swing and no one would bother it. These days, you left a cheese grater out, someone would steal the holes. P. 54. One ear floated out from the side of his head as if signalling for a turn. P. 46. I went home and showered the sweat off and read a little from a book by an author who didn't use quotation marks and was scared to death his work might be entertaining. Don't know who he's talking about with that last one, but my money's on Cormac McCarthy. Some folks think it's Charlie Huston. The cover confused me, as well as the title, until the last 50 pages cleared that up. If you liked the other H&L stories, you'll probably like this one, too.